The source of all. 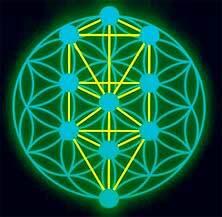 Stabilizing consciousness at this sphere is the goal of human evolution. Is the realm of the Third Eye, deepest meditation. Wisdom Spiritual Will and Purpose. Potentials of Kochma: Developing purpose and initiative, manifesting the universal plan in the world. Is the realm of pure understanding, Spiritual love and awareness. Potentials of Binah: Developing self-control, silence, secrecy, impersonal understanding and objective love. Chesed is a drink of fresh nectar, a reward and refreshment. Is the "Right hand of God". Potentials of Chesed: Deep love, bliss, tenderness, abundance, achievement, caring etc. The warrior, the athlete, the adventurer, martial artist. The "Left hand of God". Potentials of Gevurah: Right use of will and power, self-defense, confrontation, forcing of issues, courage, determination etc. Moving gently the lips of those that are asleep." Is the center of the Tree. It is the point, where the personality, moving up, first ventures into the realm of the soul. It is where spirit, descending, first splits off and becomes physical. it is where the mundane world meets the spiritual. Brings harmony and compassion to the world. Tipharet is the Golden Mean, the point of balance. It connects macro to micro, through the Golden Spiral. Potentials of Tipharet: Development of beauty, harmony, balance; centered consciousness, bringing soul into the life. Realm of feeling, clarity, brightness, sincerity, truth. Potentials of Netzach: Exploring the mysteries of loving sexuality and Venusian energies, of developing artistic and creative talents, of creating harmony around us. Realm of thought, of communication, reason, truthfulness. Potentials of Hod: Developing the mind, education, language ability, teaching, writing, concentration, visualization, humor etc. Balances the Body (Malchut), Thinking (Hod) and Feeling (Netzach). Yesod is the past we carry with us, the subconscious, memories and conditioning. Potentials of Yesod: Discovering the mysteries of the astral levels, working with dreams, fantasy, instinct, memory, purification, seductiveness etc. Fragrance: Patchouli, Poppy, Dittany of Crete.